In this version of SmartCivi you will have the following option listing a basic information of CiviCRM Data in the following. Site URL: Absolute path of your CiviCRM location. I have finished a working prototype of the form-processor and action-provider extension. See my previous blog post for where the idea came from. Below I will explain what you can do with this extension. Lets assume we have an external website where students can signup to volunteer in a summer program. When a student has signed up we want this data to be present in CiviCRM and the student added to the group student volunteers. So first we have to install the action-provider and form-processor extension. After that we can create our form processor, go to Automation --> Form Processor --> New Form Processor. Last week we had a Sprint in the wonderful city of Brussels. This blog post is a recap of what I have been up to. 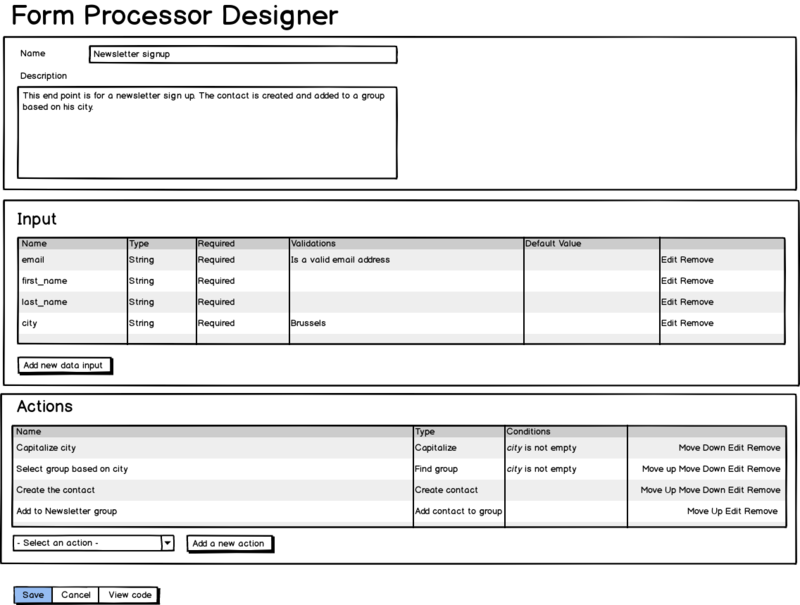 I started the sprint to work on a new extension the form processor. This idea came to my mind as I had a few clients at which I had to develop a custom api for data coming from their website (in those cases CiviCRM was separated from the website). And my idea was that I wanted to give system administrator and implementers a tool in which they could create those kind of API by themselves. So the form processor was born.